Our friend John Bush created this illustration for the Tag Team website, just months before his untimely death of non-smokers lung cancer in 2006. John was a talented illustrator, whose cartoons were featured in St. Paul Pioneer Press, Mpls. St. Paul Magazine, and many other publications. He was also a diehard Packer fan, who proudly heralded from La Crosse, Wisonsin. But most importantly, he was a beloved husband, devoted father of three, and friend to many. We miss him. My aunt Virginia lives in Edina. Over the past several years, as my cartooning has grown from interest to obsession, she’s occasionally mentioned an old friend and neighbor of hers, the late cartoonist John Bush. More recently, she mentioned to Bush’s wife, Nancy, that she has a niece who likes making comics. Nancy said that she’s been going through some of her husband’s old art supplies, and would I be interested in taking any of them? I said, of course! Aunt Virginia drove to my parents’ house in Northfield for a visit this weekend. She left the supplies from Nancy on their giant basement craft table. Thus it was that, on this snowy Minnesota morning, I found myself gazing upon…the holy grail of art supplies! Box upon box of every kind of art supply, ranging from functional to fanciful! I’m always intrigued by the materials that fellow cartoonists use: if I could, I would poke my way into all of their personal studios, to get a detailed idea of what they use, how they use it, and how they organize it. To have so many of John Bush’s art materials bestowed upon me is one of the coolest things that has ever happened to me as a cartoonist. I only wish I could ask him about this stuff, to learn more about how he used it. I’m not even sure what all of it is, or if he actually used all of it. Maybe, like my mom and me, he was a guy who never passed up an opportunity for cheap craft and art supplies–especially the weird used stuff found in junk boxes at garage sales. The paper was one of the most exciting parts to me. There is so much of it. In every size and weight and style you can think of! Lots and lots and lots of Bristol. There are all kind of mattes for framing things. And rub-on letters and numbers that I’m curious to test out in a comic sometime soon. And stack after stack of sketch paper! Then there are the paints. I have almost zero experience with painting, but my younger sister, a studio art major at Grinnell College, will no doubt find much use for them. Coolest of all? 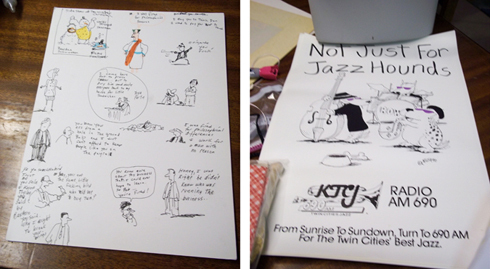 Some copies of a poster Bush made for a local jazz radio station…and a page of some of his original doodles! They remind me a bit of Jules Feiffer. I like them. Cartoonists are good people. I never get tired of learning about them. I really loved this opportunity to peek into John Bush’s creative process, by way of the tools he left behind. I will think of him whenever I use them. There you are at the Comic Jam and you have no idea what to draw and write. What do you do? Well if someone has access to the internet there are lots of resources to generate Random Stories and Ideas or you can print them out and take them to the group. These can really come in handy when doing the 24 hour comic book jam! Evil Overlord Random Plot Generator – evil plots and what NOT to do. Random Log-Line Generator: Random Story and Scene ideas. Example: A committee of nerdy art dealers gets endowed with superpowers or A fairy is secretly replaced by a superstitious cowboy in a factory. When Vladimir Propp created his theories of structural analysis in the 1930’s it is unlikely that he foresaw the advent of the computing and information age, yet his concern with structure and the modularity of his construction of narrative anticipate that of computing models and languages today. You have reached the Proppian Fairy Tale Generator, an experiment in electronic (re)writing and an exploration of the retranslation of modernist theory within the electronic environment. Here you’ll find tools for writers, gamers, and artists; randomly assembling names, concepts, and more for when you need inspiration, or just a bit of amusement. Click here to check out the writing section, to get some new ideas. 50 Random Superhero Names (with secret id too). So you want to be a hero?…All the answers are right here. Let Lee’s (Useless) Super-Hero Generator set you on the right track. Simply answer the questions on the form below and keep at it until you find the perfect name for yourself, your team, or your foe(s). Good luck, hero! Behind the Name: random names by culture. Linda Medley, the artist and creator of the comic book Castle Waiting has posted an interesting review of the Ackerman Pens’ Pump Pen (One Fussy and Messy Little Pen! Is It Worth It?). Linda gives a detailed review that should be great reading for any artist interested in different drawing tools , especially those interested in classic dip/nib pens. She illustrates the review with examples she created with the pen for her current in progress comic book. She also includes a section Make your on DIY Pump Pen. 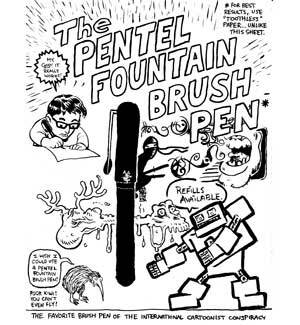 So now Wet Paint is apparently the only US supplier for two of the greatest cartooning tools ever created… the Pentel Pocket Brush Pen (which we’ve mentioned many times before) and the Fountain Pentel. I believe they are also the last place left that you can buy supplies for gocco screen printing machines, which are quite wonderful.